ALL INFORMATION BELOW IS FOR REFERENCE. IDEAL FOR AMUSEMENT PARK OR CASINO OR ANY OTHER BUSINESS WITH LARGE BILL CIRCULATION. email or call for more detail. Vault-proven JetScan™ currency processing is now available in a high-speed currency sorter! Like all Cummins built products, the JetScan MPS 4100 currency sorter is fully supported by Cummins factory employees located in over 50 cities across North America. Process all U.S. currency denominations, old or new series, as well as tickets and coupons, at speeds of 1,000 documents per minute. This speed is maintained when performing all functions of the currency sorter, even when facing bills. Security is maximized through advanced counterfeit note detection methods, including ultraviolet, magnetic and fluorescence. With its unique multi-sensor verification process, a double count is provided for every bill processed. This ensures the accuracy and integrity of every currency count. Error detection is greatly enhanced with Cummins "Flow Control" technology. Flow Control minimizes jamming by monitoring each bill throughout the entire travel path until it is placed into its appropriate pocket. Jam recovery takes seconds, not minutes. The on-screen diagram of the belt path identifies the exact spot of the jam. The operator only removes those bills. Currency that has already been routed and verified is automatically transferred to the cassettes - eliminating the need to recount these bills after the jam has been cleared. User-friendly JetTouch™ software facilitates operator control through selectable modes, allowing for a variety of customized cash processing applications. Advanced touch screen technology and thoughtful screen design reduce training and increase operator throughput. 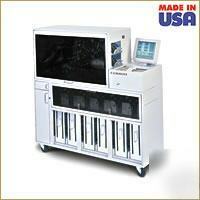 All JetScan MPS 4100 currency sorter models are made in the USA. Speed - 1,000 documents per minute. Feed Hopper Capacity - Up to 2,000 bills, with automatic continuous feeding. Offsort Pocket Capacity - 150 circulated bills. Escrow Stacker Capacity - 250 circulated bills. Weight - Approximately 750 lbs. Power - 115VAC ± 10V, 60Hz, 20 Amp. Suspect Note Detection - The JetScan™ MPS 4100 currency sorter features the latest counterfeit note detection technology including ultraviolet, magnetic and fluorescence detection. Continuous Feed Hopper - Automatic continuous feeding with a capacity of 2,000 bills. Includes special separator paddles to handle multiple batches at the same time. Lightweight Cassettes - Each 2,000 bill capacity cassette can be configured for any currency denomination and/or orientation, and are removable and interchangeable. Two Offsort Pockets - Both offsort pockets hold up to 150 bills and can be programmed to hold one or more suspect or low volume bills, rejects, or other types of media such as tickets or coupons. Adjustable Strap Stops - Separate strap stop limits can be established for each denomination. User-Defined Operating Modes - Allows up to 8 pre-set "configurations" to speed transition when shifting between different operations. LCD Flat Panel Monitor - Touch sensitive and damage resistant to hard materials such as pens, coins, paper clips, fingernails, etc. System Control - The entire system is operated via a touch screen monitor with large selectable screen icons. The JetTouch™ operating software is menu driven with operator prompts and large, easy-to-read menu screens. Entry of Non-Currency Items - Supports the entry and tracking of non-currency items such as coupons, gift certificates, checks, etc. Add-On In-Line Strapping Modules - Nearly twice the speed of competitive models, overall speed is not compromised when adding strapping modules that produce 10 straps per minute. Add-On Cassette Modules - As your requirements change or grow, additional cassettes can be added, allowing for longer, uninterrupted processing. External Bar Code Gun Option - Allows bar-coded information to be input into data screens. *Specifications provided are approximate and subject to change without notice. E-mail me with any future questions.